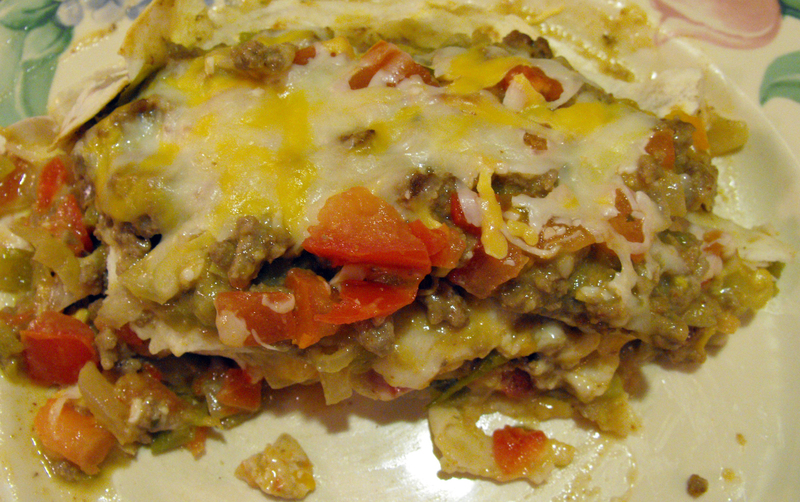 Another one of my light cooking dishes, check out this turkey tortilla pie in your kitchen this week. It’s got a distinctive Mexican flavor, but is baked, not fried, and isn’t so loaded down with cheese that you can’t lift it. If you want to add some fiber, consider using the Mission burrito-size carb balance tortillas. Just one of these will give you your entire fiber allowance for the day, and they taste pretty good, too. Preheat oven to 400°F. Wrap tortillas in foil and allow to warm for five minutes in oven while it preheats. To start your Turkey Tortilla Pie, coat a large skillet with cooking spray and heat to medium. Place turkey, onion and 1 tsp Jack’s Mexican Seasoning in skillet and cook until turkey is browned, stirring occasionally to break up meat, about 8 minutes. Increase heat to medium-high and add flour, stirring for about 30 seconds until well combined. Gradually add milk and stir until mixture thickens, about two minutes. Remove skillet from heat and add chili peppers and another tsp of Jack’s Mexican Seasoning. Coat a 9-inch deep dish pie plate with cooking spray. Place 1 tortilla in bottom in the bottom. Spread 1/3 of turkey mixture over tortilla. Spoon 1 cup of salsa or tomato on top and sprinkle with 1/4 cup of cheese. Repeat layers with remaining ingredients ending up with cheese. Cover pie plate with aluminum foil and cook until cheese melts and filling is warmed through, about 15 minutes. Uncover and bake for another 5 until cheese browns. Remove from oven and let stand for 2 minutes before serving.